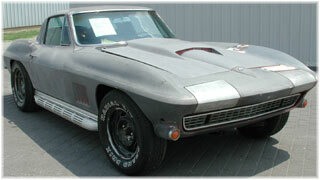 The "Last"™ Corvette is a 1967 Corvette Coupe, 427-390 hp, 4 speed, VIN #22940. It has Silver Pearl paint with Black interior and is optioned with a L-36 427-390 engine, factory air conditioning, side dual exhaust, power steering, telescopic steering column, 3.55 positract axle, M-21 close ratio transmission, AM/FM radio, tinted glass, and red stripe tires. The "Last"™ Corvette (VIN #22940) was built at the St. Louis Corvette Assembly Plant on July 12th, 1967, and was delivered new to Richardson Chevrolet in Houston, Texas. It is documented with factory tank sticker (build sheet), Oklahoma license plates The "LAST"™ 67, owner history, old 1967 photos, old title, a commemorative "Last"™ Corvette t-shirt, and restoration photos. This silver bullet is fondly known as the Caboose and is the ultimate addition to ProTeam's world class Corvette collection and was acquired from Corvette collector Bill Mock on June 2nd, 2005 and is the cornerstone of the ProTeam Classic Corvette Collection in Napoleon, Ohio. It will be campaigned, shown, and displayed throughout the United States and will be available for display upon invitation. Its story is a compelling trip from the bustling factory in St. Louis to quiet rural Napoleon, Ohio which hosts the world famous and most dynamic classic Corvette collection. The "Last"™ Corvette VIN #22940 marks the milestone of unfortunate events, i.e. : escalation of the Vietnam War, the protests against it, worldwide political unrest, 3 astronauts die in a fire aboard Apollo 1, the Doors record "The End", and as many know that as GM/Chevrolet finally got it right they proceeded with the 1968 Shark C-3 production which many believed marked "the end" and the eventual anemic horsepower ratings that came with later C-3's. This Corvette is the "Last"™ 1967 Corvette, the "Last"™ Sting Ray, the "Last"™ mid-year, the "Last"™ mid-year big block, the "Last"™ mid-year air Corvette, the "Last"™ mid-year factory side exhaust Corvette, the "Last"™ mid-year Corvette Coupe, the "Last"™ C-2, the "Newest" 1967 Corvette, the "Last"™ real Corvette, the "End" of a great era of the Corvette, and harbinger to the end of American muscle. This Corvette is the 186,981st Corvette produced by General Motors during the short fifteen years of Corvette production. The C-1 First Generation Solid Axle 1953 to 1962 Corvettes were produced for ten years with 69,015 total production but the highly popular C-2 (2nd generation) Mid-Year 1963-'67 Corvettes were produced for F I V E short years and a total production of 117,966 units ending with The "Last"™ Corvette VIN #22,940. This is a car that was called into ProTeam for sale in 1994 for $18,000.00. As our interest increased so did the price to $25,000.00 so we passed and threw the information in the round file. 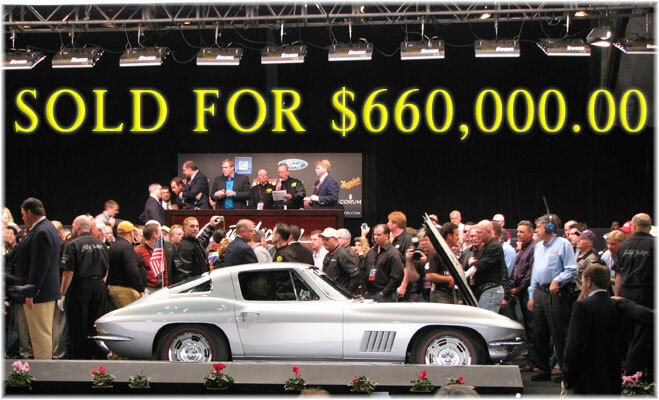 Shortly thereafter, Bill Mock, a well known collector, negotiated the purchase of this car down to $22,940.00 which was one dollar per sequential VIN number and added it to his collection of Corvettes. In early 2005, ProTeam sold several significant Corvettes and needed a like kind Corvette to wrap a promo around and feature as the cornerstone of its collection. Re-enter Bill Mock, who we were told by Gary Nabers of Houston might sell the "Last"™ Mid-Year Corvette ever produced but he wanted $250,000.00 for it and it needed total restoration. A deal was struck in late May 2005 to purchase this awesome but needy hulk for ten (10) times the final sequential VIN of #22940 THAT'S RIGHT!! $229,400.00 and still needing restoration... one might say we were nuts!!! To see dated photos, title, and tank sticker click here. The "Last"™ Corvette project has made waves across the Corvette community. Many Corvette part vendors/suppliers came forward to supply parts and services to help in the restoration that took place at Naber's Brothers Restoration in Houston, Texas. The long list of participants reads like a Who's Who of the Corvette Hobby; Naber's Motors, Restoration Battery, Eastern Corvettes, Lonestar Calipers, Ikerd's, Inc., The Illustrated Corvette Series, Paragon Reproductions, Lectric Limited, Triple A Enterprises, Auto Etc. Neon, Contemporary Motorcar Ltd., MF Dobbins Restoration & Publishing, Inc., Joe Ray Parts Co., Kustom Enterprises, DeMoise Trk-ing, J&P Custom Plating, A&B Investments, Al Knoch Interiors, Corvette Clocks by Roger, Gary Kosier Machine, Dana Forrester Watercolors, Goat Hill Classics, Auto City Classics, Inc., Crane's Corvette Supply, Carlisle Productions, Corvette Repair, Inc., DG Custom Machine, the National Corvette Restorers Society (NCRS), AutaBuy Magazine, Corvette Expo, Meguiar's, Mickey's Car Barn, ET Graphics, and Kruse International have signed-on to this historic undertaking. To learn more about each of these participants click here. The first leg of the "Last"™ Corvette's journey began in late October with a trip to Texas where it was treated to a rapid-fire rotisserie body-off Naber's restoration. The Corvette shell was in primer after being stripped to its raw form where necessary preparations were made for the next process involving removing the body so that the frame could be dipped to remove all traces of rust and old paint, bringing the frame to its original factory condition. The "Last"™ '67 restoration was complete in time for its debut at the NCRS Orlando January 2006 Regional certification meet where it earned an NCRS Top Flight. Film crews that documented the restoration process in Texas were in Orlando filming the first-time show winner during judging. The "Last"™ Corvette project is reaching beyond a simple restoration. ProTeam Corvette and Lance Miller of Carlisle Productions have come together in the fight against Amyloidosis with a $40,000.00 check on behalf of this project donated to the Chip Miller Charitable Foundation; a foundation dedicated to help research and raise awareness for the deadly disease which was responsible for the taking of one of our hobby's best friends and great ambassadors, Chip Miller. Pledging funds from The "Last"™ project was more than a marketing decision, it was the coming together to reach toward the goal of curing this cruel disease. A check for $40,000.00 was presented to Lance Miller representing the Chip Miller Charitable Foundation in Scottsdale at the Barrett-Jackson Gala held January 14th, 2007. ProTeam matched dollar-per-dollar donations with support of the most generous classic car people in the world. I just got back from Barrett-Jackson and can't seem to wipe the grin off my face, even after a couple of days to recover. I wanted to thank you two gentlemen, ProTeam Corvette and the Last Corvette project for your very generous contribution of $40,000 to the Chip Miller Charitable Foundation. You not only contributed a large amount of money, but managed to create a tremendous buzz about our Foundation's efforts in the fight against Amyloidosis. Your marketing strategy was right on the money. The Last Corvette Project took on a life of its own, generating a tremendous amount of publicity that in the end helped to support our cause. You should be very proud of what you've accomplished, not only for a worthy charity, but for the entire Corvette hobby. Your generosity and support was over the top and we can't thank you enough. Your gift will not only help our organization raise awareness of Amyloidosis and related diseases but hopefully help to someday find a cure for this deadly disease. I assure you my father was smiling down with that genuine smile that we all so dearly miss during the opening night Gala when you presented the check to the Chip Miller Charitable Foundation. It is nice to know his dream has come true... to help others in need. He's still making a difference today and will continue doing so in the future. Thank you for caring and sharing. Sincerely, Lance Miller, Carlisle Productions, Inc., Carlisle, PA."
The "Last"™ Corvette, VIN #22940, made its first public appearance in 2005 in a raw unrestored state at Bloomington Gold and also at Corvette at Carlisle. The 1967 returned fully restored to the Bloomington Gold show in June 2006 and came away with the prestigious Bloomington Gold certification. 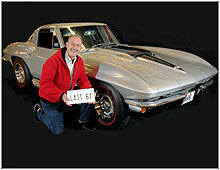 A tentative campaign/show list is available on-line at www.TheLastCorvette.com/TheLastCorvetteCampaign.html. Many many magazines have expressed interest in their participation! This Corvette has already made news most recently in Keith Martin's Sports Car Market, Northwest Signal, Corvette Magazine, Corvette Enthusiast, The Regional News, The Knoxville Sentinel, Old Car's Weekly, Vette Vues Magazine, Cars & Parts, NCRS Driveline, AutaBuy, Auto.ConsumerGuide.com, AutoChannel.com, Millionaire Magazine, Motor'nTV.com, Mobile Tech News, Road & Travel Magazine, Hemmings Muscle Machines, Corvette Quarterly, Hot Rod, Barrett-Jackson program cover, Las Vegas Review-Journal, Sky magazine, Motor Trend Classic, Defiance Crescent, MaxChevy Magazine, Barrett-Jackson Experience, Wild World of Classics television series, and various local media outlets. To check out the collection of stories, just click here. 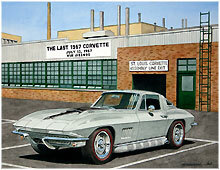 Renowned artist Dana Forrester brought this Corvette to life on canvas in the original watercolor entitled, "The Last Corvette", prints are available for purchase. The list of show dates for the campaigning of The "Last"™ Corvette road is complete. The schedule grew but The "Last"™ Corvette was show ready. Click here to see Campaign Trail in full. When not on the road, The "Last"™ Corvette sat among the finest collection of classic Corvettes at ProTeam Classic Corvette Collection & Sales in Napoleon, Ohio before its sale at Barrett-Jackson in January 2007. ... Marks the end of an unprecedented collaboration in the Corvette community. ... Marks the hopes of the Chip Miller Charitable Foundation in finding a cure. ... Marks the beginning of the next chapter in the life of an extraordinary automobile. Sold Sold Sold... In prime-time coverage of Barrett-Jackson's Scottsdale Auction on SPEEDtv, the "Last" Sting Ray rolled across the block bringing a much deserved bid for a car with such a historic and weighty pedigree of $600,000.00. As a media darling, the silver coupe received the highest honors a Corvette can have all the while being filmed for SPEEDtv's six-part mini-series entitled, "The Last Sting Ray." The "Last" Corvette Project was always intended to be more than a simple restoration and it out performed every expectation. Like minded enthusiasts came together to make this 1967 an award winner and The Chip Miller Charitable Foundation benefited from matching funds with a gift of $40,000.00. ProTeam spearheaded a project that brought attention to the Corvette hobby and the benevolence of the people involved with these great cars. The "Last" Sting Ray Project was a winner in every sense of the word. A car affectionately known as the caboose became an ambassador for the Corvette hobby. We hope the car gets some well deserved rest!